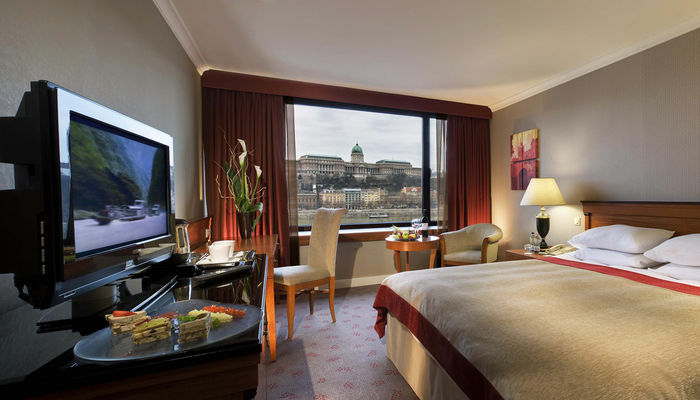 InterContinental Budapest offers 402 beautifully appointed guestrooms, including 18 river view suites and 184 superior rooms with Danube view. Carefully selected designs and materials are creating opulent yet elegant atmosphere in the rooms allowing guests to completely relax and enjoy the convenience of 24-hour room service, Instant Service Centre, WiFi, coffee & tea maker, turndown and laundry services. 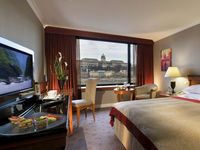 With memorable views of legendary Danube and the ever-changing Budapest skyline, Club InterContinental is designed for those travellers who appreciate personalized recognition and distinctive amenities. A wide range of exclusive services, including private check-in and check-out, dedicated concierge services, private buffet breakfast, all day refreshments, pre-dinner drinks, snacks, business centre facilities and wireless Internet are available in our Club Lounge. Corso Terrace features the same culinary delights as our Corso Restaurant & Bar, carefully harmonized with an impressive wine and cocktail selection. This seasonal eatery with live barbecue station represents a perfect place to socialize with friends, embark on a romantic evening or simply relax and watch the world go by. Our 482 square meters state-of–the-art SPA InterContinental features four tastefully decorated treatment rooms including stunning VIP spa suite for couples. Start your day with a dynamic workout in our High-Tech fitness centre. Enjoy a complimentary fresh fruit and refreshment in our relaxation area before letting one of our highly trained therapists fully rejuvenate your body and soul. SPA InterContinental offers a rich variety of body, facial and beauty services. Our resistance swimming pool and resting beds are anxiously awaiting you to put the final touches on your day filled with indulgence and pampering. Hosting many of the largest and most prominent city events in the past, InterContinental Budapest's conference and meeting space facilities stand alone as a premier choice for meeting initiatives of all types for 10 to 850 persons. Unique in their size and tradition, our 12 meeting rooms featuring natural daylight are fully equipped with the latest audio-visual technology. Boasting over 740 square metres (8000 square feet), our Ballroom creates an ideal setting for your fantasy wedding and special celebrations customised entirely to your needs. • Breakfast is not included in room rates. It is available at 28 EUR per person. • Using the Internet connection costs 25 EUR per day. • Garage is available for guests at 28 EUR per car per day. • Pets are allowed for an extra charge of 40 EUR per day. Deluxe rooms are overlooking the Castle hill and the Royal Palace.